Now this is interesting concept in muzzle brake. If any visitors to this page purchase one I would appreciate some feedback on performance. 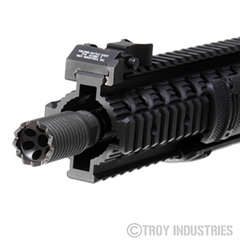 From the manufacturer:The Troy Claymore Muzzle Brake directs muzzle blast and sound forward, away from the shooter, while retaining effective muzzle brake properties. Very low dust signature, without swirling effect. Works as an improvised breaching device. 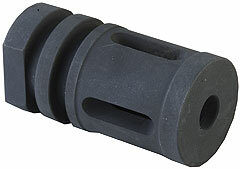 The Battle Comp Enterprises is another line of flash hiders/muzzle brakes that have absoluteley no familiarity with. Same as above I would like feed back from anyone with experience. Visit BattleComp. Puts an end to muzzle flip and felt recoil for more comfortable shooting and faster follow-up shots. No machining, cutting, or fitting required to install on most guns. Fits .223 caliber, AR-15 rifles with threaded muzzles. Just remove the factory brake and screw this one on. Here is a pretty interesting muzzle brake/flash supressor. If any visitors have experience with them please send me a message with some feedback. In response to rule changes regarding compensators on rifles for tactical match use, JP Enterprises developed an all-new recoil eliminator design. Rifle compensators used for tactical matches such as the SOF, WC 3-Gun and USPSA Limited Class must meet the new 1” by 3” size. In addition, some people prefer a slimmer, more compact configuration in their rifle compensator but didn't have a worthy alternative until now. Low-profile steel compensator redirects and harnesses combustion gas energy to reduce felt recoil by as much as 70% compared to an uncompensated barrel. Helps the shooter stay on target for accurate follow-up shots and fast transition to the next target. Built to the exacting requirements of noted professional weapons instructor and tactical competition shooter Bennie Cooley to combine the recoil reduction of J.P.'s popular Recoil Eliminator muzzle brake in a slim, streamlined compensator that meets the 1" x 3" size requirements of SOF, WC 3-Gun, USPSA Limited, and other tactical rifle competitions. Large, flat interior baffle surfaces allow the bullet to pass through while redirecting the rapidly expanding gas to the sides and slightly forward through the square-cut side vents to create forward thrust that counteracts bullet recoil. The higher the pressure, the more counteracting force the comp actually provides. In addition, four tuned ports on top minimize muzzle rise, further helping the shooter keep the sights on target. Solid bottom prevents kicking up a dust signature when shooting prone. Precision-machined from high-grade carbon steel, with a tough matte black oxide finish, or stainless steel with a brightly polished surface. All models fit rifles chambered in .223/5.56mm; can be bored out for larger calibers. Standard Profile available for barrels with .750" or .875" O.D. at muzzle. Large Profile is a beefed-up version of Standard model for .875" O.D. bull barrels and has extra baffle surface area for maximum reduction of felt recoil while retaining the cosmetics of the Standard series. Not legal for Limited Tactical Division competition. "Radical performance" sums up the JP Recoil Eliminator, which allows for the fastest possible sight recovery and the highest level of recoil reduction possible. Dual, curved restrictor plates with a tremendous amount of surface area stop exiting barrel gases and pull the barrel forward to counteract recoil and muzzle flip. The front sight or scope stays right on target for a faster second shot, plus less felt recoil and shooter fatigue. 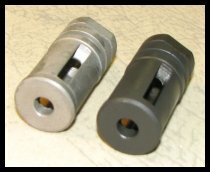 AR-15 model threads onto standard 1/2"-28 tpi barrels; Tapered Nut model can be fitted to barrels from .600" to .650" diameter, threaded 1/2"-28, in calibers up to .358. Three large expansion chambers, asymmetric baffles along with four unique top ports redirect muzzle gases to reduce muzzle rise and allow you to stay on target. CNC machined from 416-series stainless steel and black oxide coated for durability. Fits 5.56 NATO (.223) caliber, 1/2"-28 tpi threaded barrels only. Inspired by E-Tac"s own Talon Breacher Brake for Shotgun, this is one of the coolest looking best functioning rifle brakes on the Planet. Besides looking great it works incredibly well with virtually no recoil and a very satisfying deep yet relatively quiet report without concussion. It is the beefiest brake we know of and was designed to take incredible abuse. Like the Talon Breacher brake, the Talon Tips will persuade yet not unintentionally cut skin. Precision CNC machined from pre-hardened billet chrome moly steel. Machined from bar stock with an integral, solid baffle that won't shoot out. Top and side ports counter recoil and muzzle rise. Solid bottom controls dust printing. A-2-style looks correct on pre- and post-ban rifles. Includes roll pin for permanent installation. Simplifies conversion of pre-ban barrels to post-ban configuration. Machined steel compensator employs a simple, open-topped design that directs combustion gases upward to virtually eliminate muzzle rise and felt recoil. Allows fast, accurate follow-up shots in semi-auto mode and superb control in full auto. Based on an original design by Greg Carlson, a dedicated Class 3 shooter, for use on machine pistols, the Flash .223 is exceptionally effective on carbines and short-barreled AR-15/M16 rifles. Two large, longitudinal ports vent gas upward at roughly 45 degree angles to counteract upward force on the muzzle without directing concussion and noise back at the shooter, so a rifle equipped with the Flash .223 is no louder than one with a standard A2 flash hider. Solid bottom prevents kicking up dust signature when shooting prone. Highly-efficient internal helical design uses ten precisely contoured longitudinal ports combined with a unique, cloverleaf-shaped exit port to trap unburned powder particles long enough for full burn and dissipation of hot combustion gasses. Muzzle flash cancels itself out to minimize shooter exposure during daytime and low-light situations. Also serves as a compensator by directing venting gasses to help reduce muzzle jump and improve shooter control for better shot placement. Precision machined from 4140 steel to stand up to rough tactical operations. 2-1/8" overall length brings a 14 1/2" barrel up to legal length for civilian use when flash suppressor is permanently pinned or welded in place. Accepts most sound suppressors and Blank Firing Attachments designed to fit a M16/M4 flash hider. VC-1 fits .223/5.56mm AR-15/M16/M4 rifles; VC-301 fits .308/7.62mm AR-style rifles. Unique, patent-pending design redirects concussion forward to provide better flash suppression than standard A2 suppressor on short-barreled AR-15/M16/M4 rifles and other centerfire gas-operated weapons. Virtually eliminates side blast to protect nearby personnel during CQB, building entries, and when shooting from inside vehicles. Lessens felt recoil and reduces muzzle rise to help keep sights on the target for fast follow up shots and superior recoil management on full-auto assault rifles, especially with barrels 13" or shorter. High-carbon steel with matte black manganese phosphate finish stands up to the heat and pressure of thousands of rounds. Convenient, 3/4" wrench flats allow easy installation with the same wrench used to remove factory flash suppressor. Crush washer included. Each unit individually serial numbered for quality control. Flat, non-serrated muzzle face helps prevent catching or snagging muzzle tip during storage or deployment. Five, longitudinal vents help hide flash while dispersing gases up and outward; tames muzzle rise and keeps your front sights on target. Outward facing ports and solid panel on bottom help eliminate dust signature when shooting in the prone position. For threaded barrels only, includes crush washer. .223 model has grooved, base rings that accept training attachments and sound suppression devices for LE and military personnel. Five, straight, longitudinal vents hide flash while dispersing gases up and outward to tame muzzle rise. No downward facing port helps eliminate dust signature when shooting in the prone position. For threaded barrels only, includes crush washer. .223 model has grooved base rings that accept training attachments and sound suppression devices for LE and military personnel. Chisel-shaped front notches keep muzzle planted on your attacker during CQB situations. Longitudinal ports help minimize the blinding effects of muzzle flash in low light for improved target acquisition during night operations. Screw-on design for threaded barrels only. Includes crush washer for proper timing of vents. .223 model has four ports and aggressive, serrated notches at the tip that provide extra insurance in hand-to-hand combat. Integral rings at the base accept military sound suppressors and allow mounting of Blank Firing Attachments (BFAs) for training exercises. .308 has five ports and smooth, non-serrated muzzle tip; no BFA ring at base. 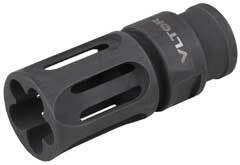 The Wilson Combat Accu-Tac AR flash hider sports a three-pronged external profile and Wilson’s exclusive external accurizing flutes, improving muzzle harmonics over other blast dispersing brakes. These extensively tested features effectively dissipate flash and minimize muzzle signature, but unlike many competitive AR muzzle devices, the Accu-Tac has no negative impact on accuracy. Hardened 4140 steel, fits standard, GI threaded AR barrels. This is the complete video from the VLTOR section above.